The face-up is a natural one for more versatility. I used the same idea I did for the Pipos Kitty and put a little lavender to the inner corner of the eyes. It just looks so nice, I can't believe I haven't done this before! She'll (or he, I'm just used to referring to Beylas as girls) be sold as a head-only with these acrylics included (but not including body, clothes or a wig) so basically as in the face-up compile photo. But once I put her on this body to take photos showing a possible styling I just fell so much in love with her! She's almost like a WS Hani Q_Q But I really need to let her go, I need the cash and I can't really justify yet another copy of this sculpt, nevermind how it is my favourite... Thenagain if she doesn't sell... :P But I hope she does and goes to a good home! 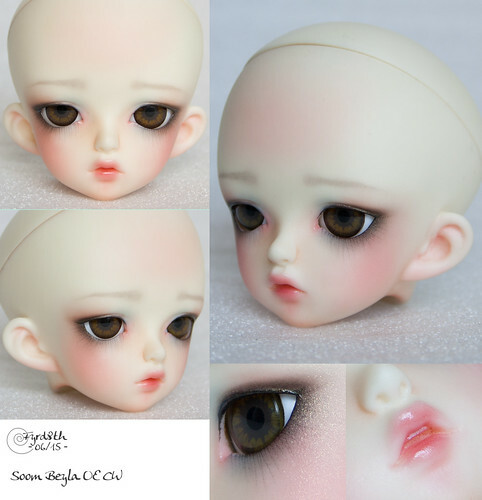 Maybe I just need to redo Hani's face-up, since I wasn't 100% satisfied with the new one. I'm hoping to get 120€+shipping from the head. She won't come with Soom's box, pillow or certificate (since I have the rest of the doll here I can't really give away the certificate, I could scan it though? ).